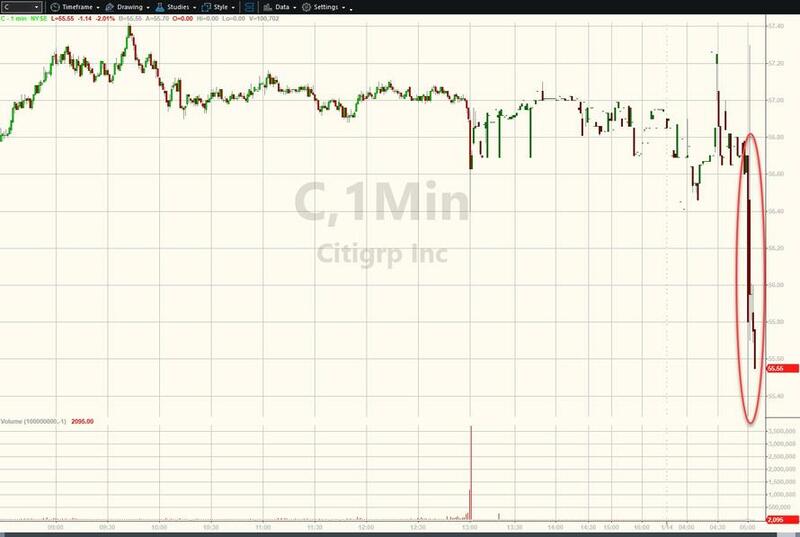 While traditionally it is JPMorgan Chase that kicks off bank earnings season, this quarter, Citigroup is taking the spotlight with its just reported Q4 results (followed by JPMorgan and Wells Fargo & Co. on Tuesday), and its earnings numbers are anything but a welcome harbinger for what to expect. 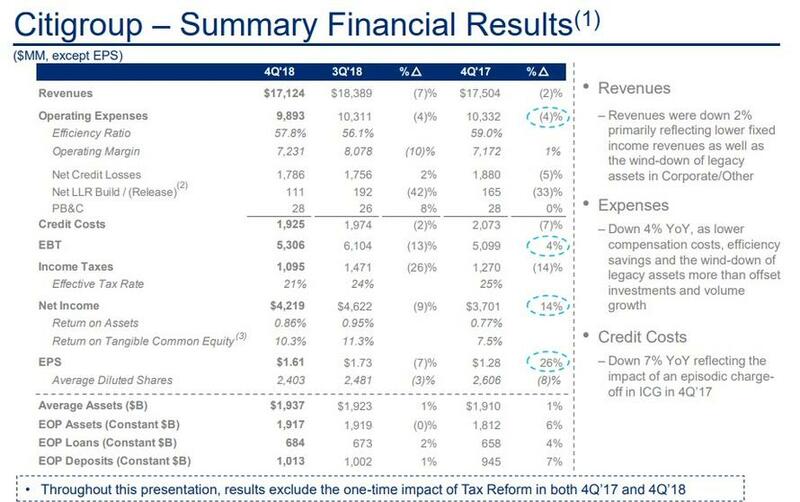 Citi reported adjusted EPS (excluding tax reform effect) of $1.61, slightly better than the consensus estimate of $1.55, thanks to a drop in the company's effective tax rate, which dipped to 19% in Q4, and would have been 21% ex-tax reform, both lower compared to the 25% a year ago. That was it for the good news, because one look at the top line reveals an unexpected deterioration, as 4Q revenue of $17.1BN dropped 2% Y/Y and missed the consensus estimate of $17.6BN badly, dropping to a two-year low as a result of a plunge in fixed income markets revenue which fell 39% sequentially and 21% y/y to $1.94b vs estimate $2.23b. This was the lowest fixed income print since 2011, and the worst performance under CEO Michael Corbat. While the FICC miss was disappointing, Bloomberg Intelligence banking analyst Alison Williams notes that even more important will be the outlook for trading in early 2019 and more detail on costs: "Rates and currencies is a key business for Citigroup, given its share of Citi overall revenue, but this could also signal weakness at peers since Citi and JPMorgan are leaders in global FICC." It wasn't just fixed income: equity markets revenue also fell 16% q/q, however despite rebounded 18% y/y to $668MM, it also missed the $672MM consensus estimate. 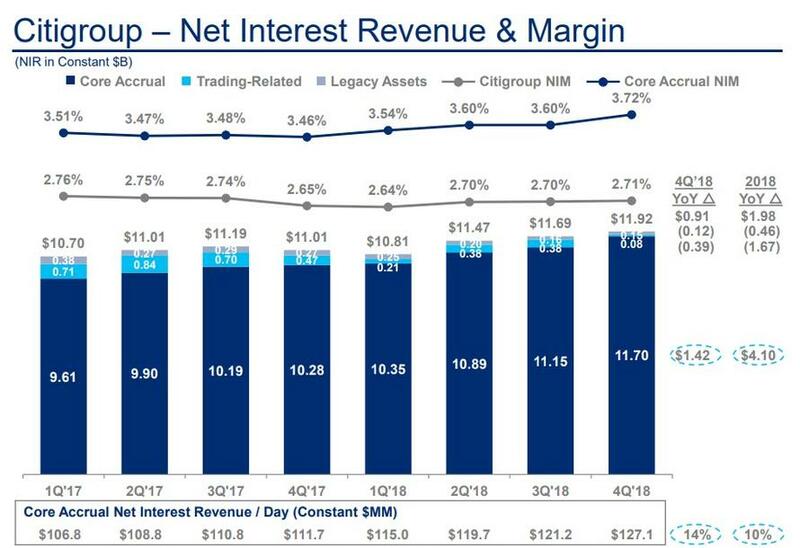 Indicating just adverse the trading environment of the past month was, Citi missed a full-year profitability target by an even bigger margin than it signaled only five weeks ago. The silver lining: investment banking revenue rose 8% q/q, and yet despite the 1% Y/Y decline, at $1.28BN it modestly beat estimates of $1.18BN, as M&A advisory revenue jumped 47% to $463 million. According to Bloomberg, the combined revenue from stock and bond underwriting dropped more than estimates. Revenue from stock underwriting slumped 28% to $181 million, worse than analysts anticipated, while revenue from bond underwriting fell 13% to $634 million, a smaller drop than estimated. 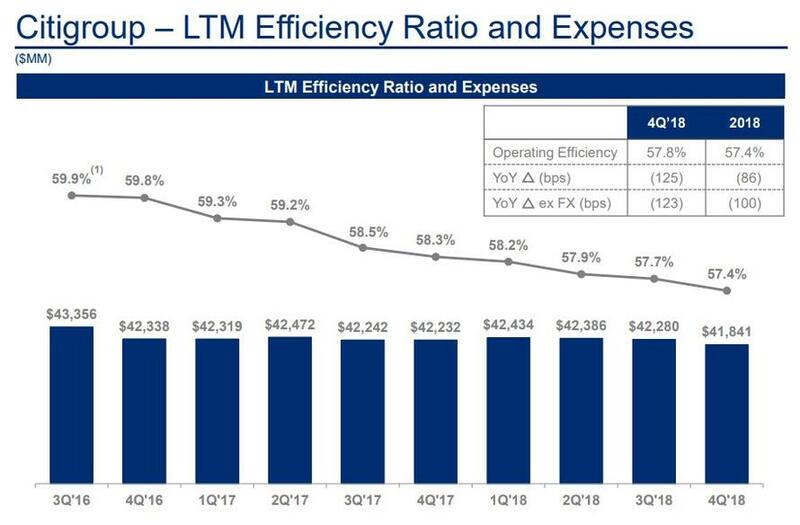 Meanwhile, on the expense side, 4Q operating expense fell 4% y/y to $9.9b, driven by lower compensation costs, efficiency savings and wind-down of legacy assets, partially offset by investments and volume growth; the bank's 4Q efficiency ratio dropped again to 57.4% vs 57.7% in 3Q. There were no major shocks in the bank's balance sheet, as 4Q loans rose 3% to $684BN, while excluding FX translation, loans rose 4% even as loan growth by all the big banks has slowed considerably (from low teens in previous years to single digits), pointing to slowing U.S. economic growth. At the same time deposits rose by 6%. 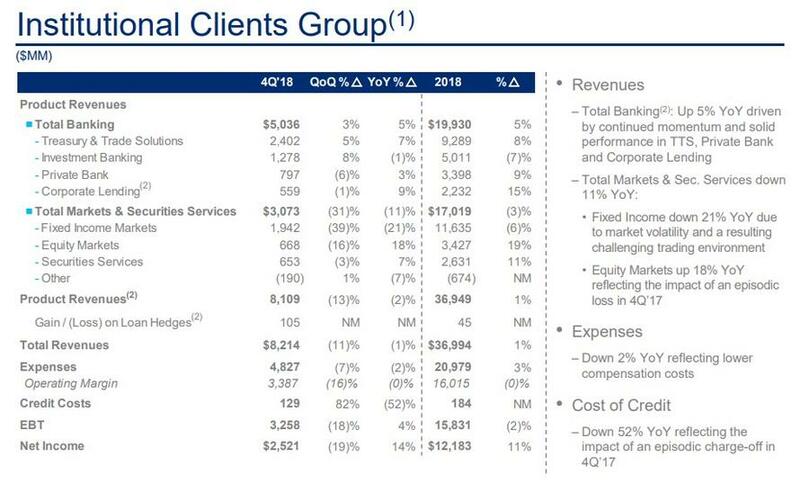 According to the report, the bank's 4Q cost of credit fell 7% y/y to $1.93BN, primarily driven by an episodic charge-off in Institutional Clients Group in prior-year period. The bank's Net Interest Margin was virtually unchanged in Q4, rising fractionally to 2.71% from 2.70% in Q3. Citi's credit card revenue rose 1% to almost $5.1 billion: as Bloomberg notes, investors have become increasingly worried as rising interest rates temper consumer demand. Citi has been cutting promotional offers and encouraging existing customers to maintain balances. The bank's allowance for loan losses in Q4 was $12.3BN, or 1.81% of total loans virtually unchanged from the $12.4BN, or 1.86% a year ago, suggesting that the bank sees neither an improvement nor deterioration in the broader economy. In Q4, Citi as one would expect, repurchased 74 million common shares in 4Q. “A volatile fourth quarter impacted some of our market sensitive businesses, particularly Fixed Income. However, our ICG accrual businesses – Treasury and Trade Solutions, Securities Services, Private Bank and Corporate Lending – continued their strong performance. And in Global Consumer Banking, we had good underlying growth in U.S. Branded Cards and solid performance from our franchise in Mexico where we have been investing. For 2019, we remain committed to delivering a 12% RoTCE and continuing to improve our operating efficiency during the year." The market was clearly displeased with the collapse in Fixed Income revenue, which however had been telegraphed earlier by another weak report from Jefferies, and now the risk is that the other big banks will follow with similar slumps in the highest-margin business segment at a time when Net Interest Margin has collapsed thanks to the near inversion of the yield curve.